That appeared to be true last May, when an NDI-CRRC public opinion poll declared that 31 percent of Georgians favored ECU membership. Have voters in the Republic of Georgia suddenly begun to prefer an affiliation with the Russian-led Eurasian Customs Union over their existing affiliation with the European Union? If true, it would be shocking. Since its independence in 1991, Georgia has favored Europe overwhelmingly. Polling has found levels of support for the EU that Brussels could only dream of elsewhere in Europe, and serious ongoing problems between Georgia and Russia would naturally strengthen those pro-Europe leanings. Certainly, many observers have taken that poll number to heart. Nearly a dozen publications and organizations—such as the Financial Times, the Washington Post, Al Jazeera, the Wall Street Journal, Foreign Policy, the BBC, Foreign Affairs, Carnegie Endowment, and Brookings Institution—have cited the number. It even seems to have influenced a Roll Call op-ed, the first sentence of which cited “recent news accounts” on Georgia and Ukraine. Almost every news account on Georgia at the time cited the number. But that number hasn’t changed since 2013, when the Caucasus Barometer examined support for Georgian Customs Union membership. Moreover, the number by itself is misleading. The data show far fewer Georgians are consistently pro-Russian. ”The Russian turn” has been overstated. In August, Georgians were asked whether they approve of the Georgian government’s goal of joining the EU and whether Georgia should join the Eurasian Customs Union. Twice as many Georgians prefer the EU to the Eurasian Union, 61% to 31%. This has been largely consistent over time, although support for the EU has had its ups and downs with a slight decline in recent years. Nonetheless, support for the Eurasian Customs Union has never been more than half the level of support for the EU. Georgians fall into four consistent groups about union membership. Here’s the largest one: 39% say they would vote for the EU and against the Customs Union (marked in the graph below as pro-EU). 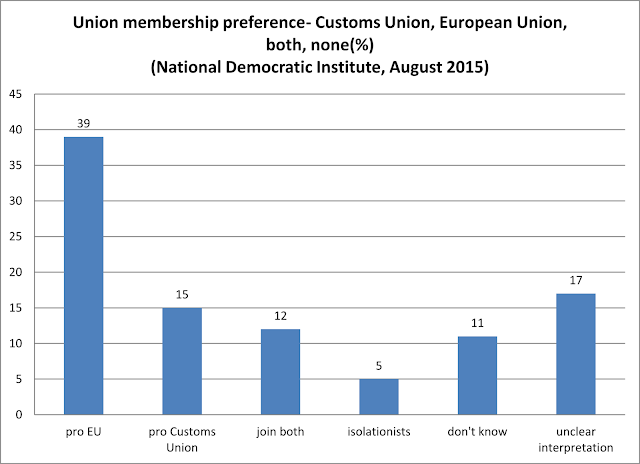 Only 15 percent would vote for the Customs Union and against the EU. The joiners, 12 percent, support membership in both unions. And the isolationists, 5 percent, would vote against both unions. Another 11 percent don’t know how they feel about either union, and 17 percent had responses that didn’t really have a clear interpretation. Why would any Georgians support economic union with the nation’s former oppressor, Russia?